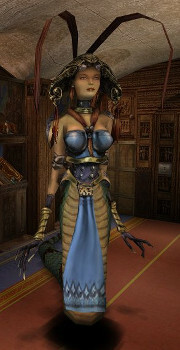 Chinkashh is a Snake Woman stationed in the library inside the Castle of Arx and a member of the Council. The character name is spelled "Chinkash" in the voice acting credits and some dialogue lines. This page was last modified on 21 June 2017, at 17:24.